Updated> Education Minister Bandula Gunawardana said that the cut-off-point of the Year-5 scholarship examination has been reduced from 163 to 157. 2014 Grade 5 (Year Five) Scholarship examination results released September 28. එම දෙපාර්තමේන්තුව නිකුත් කළ නිවේදනයක දැක්‌වේ. The Exam results will be released to Examination Department official Web Site www.doenets.lk . Pass marks for students in Colombo, Gampaha, Kalutara, Kandy, Matale, Kurunegala, Galle, Matara and Kegalle districts were 163. 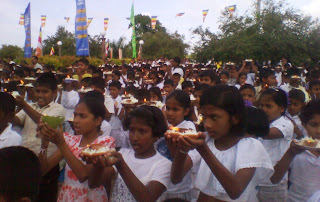 The second highest margin, 161, was for students from Anuradhapura, Ratnapura Polonnaruwa and Hambantota Districts. Pass marks for other districts were: 160 for Ampara, Trincomalee, Puttalam, Badulla and Moneragala, 159 for Nuwara Eliya, Mannar, Vavuniya and Mullaitivu. Warmly Wishes, All the Very Best and Good Luck for those who are doing Grade 5 Scholarship Examinations in 2014!!! Examination Commissioner General Jayantha Pushpakumara says the year 5 Scholarship Examination was conducted successfully today. Only two incidents were reported from Pitabeddara and Dambulla areas. Several students at Balapathella in Pitabeddara were unable to reach the Examination centre due to floods in the area. However, they were brought to the centre by a boat and arranged facilities to sit for the Examination. Another student who faced an accident at Dambulla area was admitted to the Dambulla hospital. The Commissioner told the SLBC that the question paper was sent to the hospital for the student to answer the Examination from the hospital bed. Education Ministry has banned taking photo copies, selling or releasing the 2014 question papers. 2014 scholarship Past papers can be printed only after a certain date, given by the Examination Commissioner. Evaluation of the answer scripts of this examination will begin on the 26th of this month. 2014 Grade 5 (Year Five) Scholarship examination results to be released 1 st October 2014, World Children's Day or before that. We will report you the exact date later. Old News The 2014 Grade 5 Scholarship examination will be held today (August 17) with 334,600 students sitting for the exam in 2386 centers islandwide. The Examinations Commissioner requests candidates to be at their respective exam center by 9am. All arrangements are underway to hold the grade 5 scholarship examination August 17. A staff of about 18000 personnel is deployed on examination duty. He called on the students and the parents to be present at the centres before 9.30 am when the examination starts. The staff is banned from taking photo copies, selling or releasing the question papers. They can be printed only after a certain date, given by the Examination Commissioner. 2014 Grade 5 (Year Five) Scholarship examination results to be released 1 st October 2014, World Children's Day. Kata hari colombo campus application awada. result sheet ekak download karaganne kohomada dr? ?